The powder room many times go unnoticed by homeowners because it isn’t your personal bathroom. In fact, this space can be neglected for decades when renovations happen in every other room of the house. The guest bathroom is a place that you can wow your guests pretty easily with just a little attention to detail. Go big - Use bold colors and designs to make a statement. 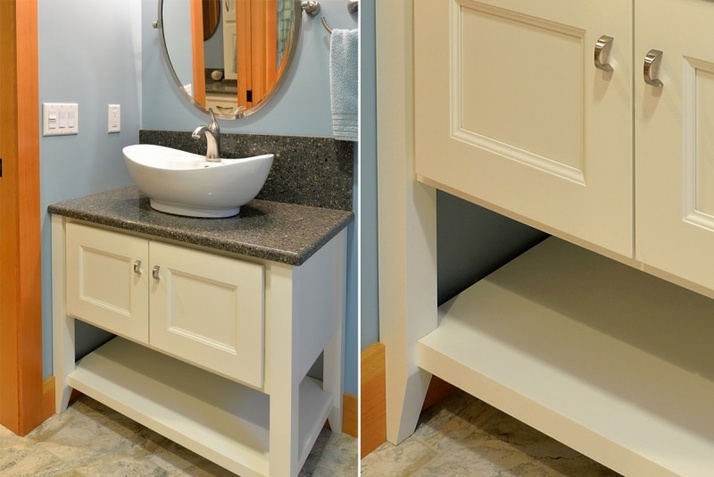 Instead of conventional shapes, try something completely different for a sink. Instead of plain beige counters, try a dramatic black granite. Don’t let convention dictate what you do when it comes to the guest bathroom. There are many innovative and fascinating designs available. Choose a single feature build around it. Create a focal point - Find a vanity, a mirror, or even a toilet that’s advanced enough that it becomes the focal point of the room. Focus all of your design around that. For example, if you find a free-standing sink in a modern style, let that dictate a modern feel for the rest of the decor. It you find a cabinet that is made from extraordinary wood, design the room to feature that. Multi-layer lighting - Instead of just lights above the mirror, put lights in the ceiling. Use accent lights under shelves. Give the room multiple levels of lights so that it feels larger and more comfortable than guest bathrooms usually are. Color, color, color - Nothing is more depressing than a tiny room, unless it’s a tiny room with nothing but browns and beiges in it. Choose a great wallpaper. Try a nice bright paint. Make designs on the walls in multiple paint colors. No matter what you do, make sure that you use colors in the room. Open shelves and cabinets - You can use open shelves and cabinets to create a feeling of more space. You can also use towels and washcloths as decoration. The colors of the bath linens can be a part of your overall design. These elements can be easy to change as well allowing you to vary colors and designs with the seasons and your moods. The guest bathroom is a place that you can easily impress your guests. From traditional to ultra-modern to simply outrageous, this is one room where you can make a statement that will keep your guests talking long after they’ve gone home.